On Friday, Deputy Attorney General Rod Rosenstein announced the indictment of 13 Russians in the special counsel's investigation of Russian interference in the 2016 presidential election. The charges are the latest chapter in a probe that has haunted President Trump since he entered the White House, and tortured an anxious public waiting to see if, or when, it reaches the oval office. "The indictment charges 13 Russian nationals and three Russian companies for committing federal crimes while seeking to interfere in the United States political system, including the 2016 presidential election. The defendants allegedly conducted what they called information warfare against the United States, with the stated goal of spreading distrust towards the candidates and the political system in general." 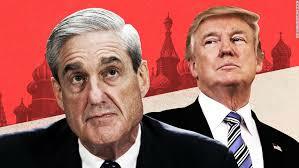 The President hailed the indictment of the Russians as proof of "no collusion" on the part of his campaign, but his comments ignored the fact that they are just one component of a much larger, umbrella investigation that already includes indictments of four of his former campaign advisors. In October former Trump Campaign Chairman Paul Manafort and his longtime business partner Rick Gates, were charged with 12 counts of conspiracy against the United States, conspiracy to launder money, illegal foreign lobbying, lying to federal agents and other charges related to their work for the government of Ukraine and a Russia-affiliated Ukrainian politic al party. In December Trump's former Former National Security Advisor Michael Flynn, was charged with lying to the FBI, and former Trump foreign policy adviser George Papadopoulos pleaded guilty to similar charges earlier. Then this morning, in what is truly a daily drama, the special counsel's office the announced yet another indictment -- bringing to 19 the number of people charged in the ongoing investigation. Alex van der Zwaan, a London-based attorney with Skadden Arps, was charged with lying to investigators about his communication related to a Skadden report which was commissioned by Gates and Manafort for their work with Ukrainian politician Yulia Tymoshenko. van der Zwann is also the son-in-law of Ukranian-Russian oligarch German Khan, co-founder of Alfa Bank and who, according to the US Treasury Department, has close ties to Russian President Vladamir Putin. Khan was also named in the "Steele Dossier," a report by former British intelligence agent Christopher Steele which outlines damaging allegations about Trump and his advisers' ties to Russia. Others who have been interviewed by the special counsel regarding related communications with Russian officials include Donald Trump, Jr, son-in-law Jared Kushner, former Trump campaign advisor Carter Page, Trump attorney Michael Cohen and Attorney General Jeff Sessions. The investigation, headed by former FBI Director and special counsel Robert Mueller, falls under the jurisdiction of the Department of Justice (DOJ) and is separate from the three Congressional probes President Trump and his advisors are facing. The charges against van der Zwann have fueled speculation about the next link in the intricate web of connections between the Trump campaign and the numerous moving pieces that include illegal collusion, financial crimes and, potentially, conspiracy.